This is a card that I made for the latest “Card Challenge Tuesday” on the Bo Bunny blog. The challenge was to work with aqua, pink and red in the card’s design. I used papers from Bo Bunny’s Love Bandit, Double Dot in Poppy and a rub-on from the Persuasion collection. 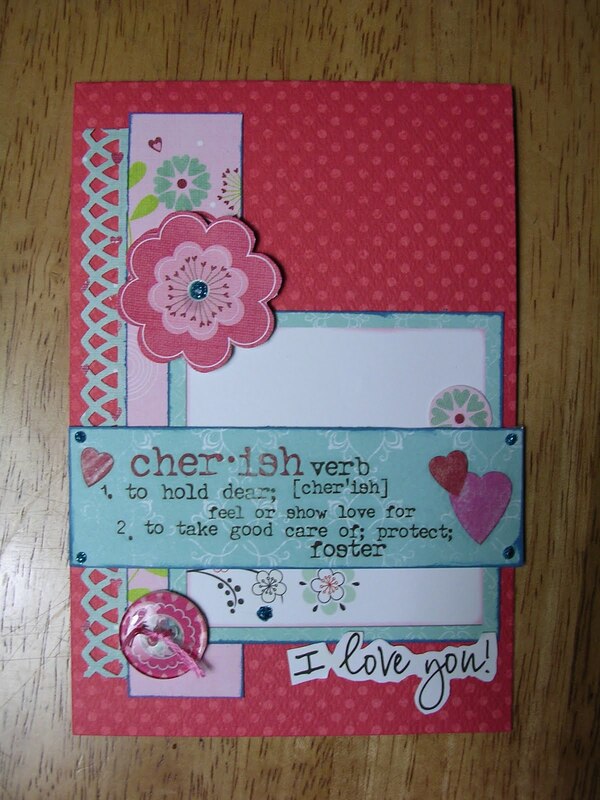 The square comes from the Alissa cut-out page, as well as the “I love you!” sentiment at the bottom. I glued a circle of paper to the back of a clear button and threaded it for an accent. I used a border punch to accent the strip on the left side. It was a fun challenge! Looking forward to the next one! Now this is an adorable card! and what??? no googly eyed animals. What is this world coming to?